With many car and motor events across the country, what makes the Silverstone Classic a stand-out event? The Classic is a fully inclusive family festival and is proud of its access all areas policy – uniquely, included as standard with each and every ticket is full access to the paddocks and all open grandstands, live music concerts, the vast majority of all funfair rides, parking, and much more. The Classic not only features the very best in historic motor racing from across ten decades but it also offers flat-out fun for all the family, too. It’s got it all! Are there any new and exciting features or activities we can look forward to this year? Each year the Classic celebrates landmark anniversaries for marques, models, championship wins, constructors, and historic motorsport moments – there’s nothing more we enjoy than a birthday celebration! Details of what will be taking centre stage in 2019 will be confirmed over the coming months… so watch this space! The Silverstone Classic has been running its legendary events since 1990, do you have a favourite moment from one of the past shows? There are so many special moments from over the years that it’s tricky to pick out a favourite. Our 25th anniversary year in 2015 was pretty special, though, our legendary epic race schedule on track was perfectly complemented by an evening of the ultimate rocking, courtesy of Status Quo. 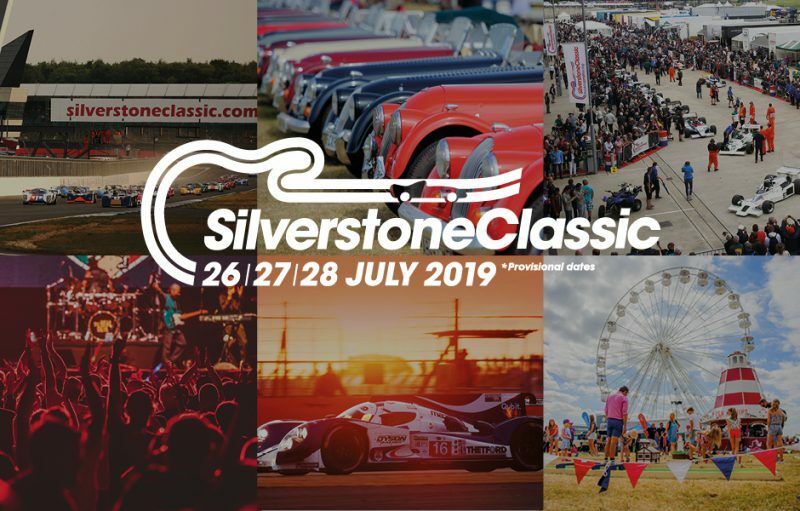 Is the Silverstone Classic suitable for families with young children? And if so, what sort of activities can they get up to? Absolutely. The Classic is an event for all ages. We have all sorts of activities including free funfair rides, crazy golf, 4×4 rides, stunt shows, air displays, face painting, an adrenaline zone and much more. In recent years you’ve had some great music line-ups, can we have any clues on who’ll be playing at next year’s event? All we can say for now is that, as part of our anniversary celebrations we’ll be paying special tribute to a huge moment in live music history! We’ll have more we can say in the new year. For owners of cars made before 1999, what makes your RetroRun package an unmissable opportunity? The package enables owners of classic cars to not only enjoy all that the event has to offer, but there’s also the chance to enjoy a stunning driving experience with other like-minded RetroRunners on Saturday passing many other places of interest enroute before returning to the heart of the Classic on Saturday afternoon with an exclusive, dedicated area inside the circuit for displaying all the RetroRun cars. On top of that, there’s also a unique opportunity for RetroRunners to drive their cars around the iconic Grand Prix track in a revered parade lap, too! And in your opinion, what is your favourite classic car? That’s like being asked to choose your favourite child!! Don’t miss out on tickets to the event of 2019! Super Early Bird tickets are available until 31 December and are selling fast so grab yours now.